This is a 8x12" Alabama Flag which is mounted on a 1/4" x 18" Staff. 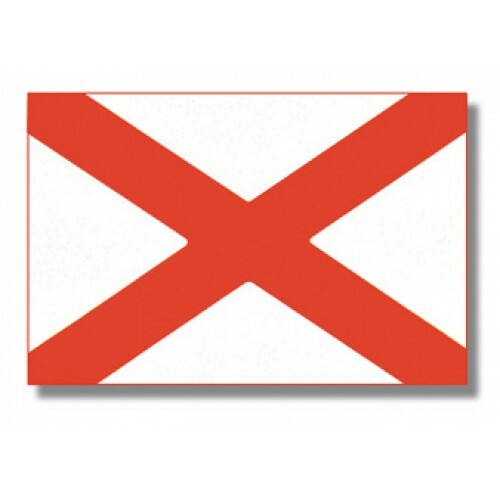 This size flag is popular for parades, promotional giveaways, table tops and/or desks. 5x8' Nylon American Flag This 5x8' Nylon American flag features an Embroidered Star Field and.. This is a 4x6& Greece Flag which is mounted on a 3/16& x 10& Staff. This size flag is popular for p.. This 3x5' Nylon American flag features an Embroidered Star Field and Sewn Stripes to provide both be..